Around the Galaxy Messier 94 a starburst ring is at work birthing new stars into the Universe. 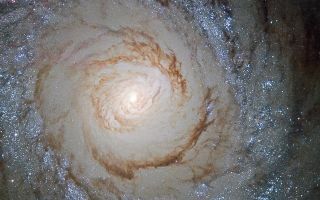 Around the Galaxy Messier 94 a starburst ring reveals the birthing of new stars into the Universe. Likely caused by pressure waves emanating from the galactic center, compressed materials inside dense clouds create gravity which attracts the gases and dust, heating and pressurizing them into new stars.